The grant will be used to study and implement the best practices for rain and storm water collection in 47 community gardens. LOWER EAST SIDE — A $2 million grant from the state will outfit more than 40 East Village and Lower East Side community gardens with protections against future flooding caused by major storms. The New York City Community Garden Coalition plans to use the grant — awarded by the New York State Governor’s Office of Storm Recovery — to conduct a study for “storm water capture best practices,” and apply the results to 47 neighborhood gardens, the group announced online. The plan was first reported by The Lo-Down. 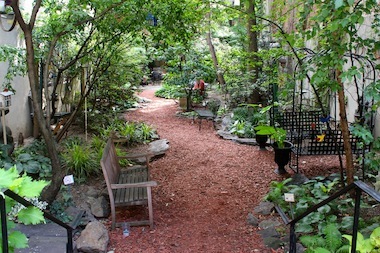 “It’s a very cool thing happening," NYCCGC Treasurer and East Village gardener Charles Krezell told DNAinfo New York. "It’s changing the whole idea of what community gardens can be in the city and seeing the value of them as an environmental piece." The project will build upon the gardens’ existing ability to absorb water — they already collect about 10 million gallons each year, Krezell said. The extra protection will help prevent sewers from overflowing during a larger storm, he added. Possible structures that could be installed after the study include underground tanks that would allow gardens to collect more water and bioswales, which use plants to absorb water, Krezell said. The master plan is expected to be completed and approved by October next year, according to the NYCCGC’s website, with the implementation and construction completed by September 2019. Each garden will be able to look at the plan and decide individually if it wants to participate in the project, Krezell said. The NYCCGC will formally announce the study, dubbed “Gardens Rising,” at a press conference with state and city officials on Monday morning at La Plaza Cultural Community Garden on East Ninth Street and Avenue C.